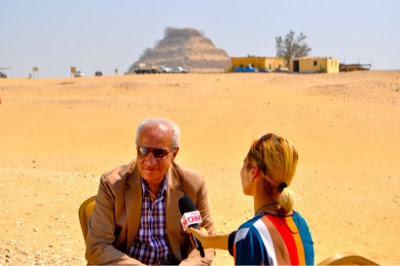 Dr. Mohamed Ibrahim, Minister of Antiquities, announced that the Egyptian Spanish mission headed by Dr. Myriam Seco Alvarez working in the funerary temple of Thutmosis III on West Bank, Luxor has discovered a black granite head representing a King of the New Kingdom. The discovered head measures 29.6 cm height, 24.3 cm width and 26.9 cm depth. The Minister said that the first look on the details of discovered statue head shows that it is likely belongs to a statue of a king followed the reign of Thutmosis III but to determine for sure, it would require more study. 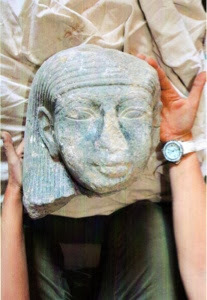 Mohamed Abd Al Maqsoud, head of the Egyptian Antiquities department said the head was discovered in the trench at the northern side of the second courtyard of the funerary temple. He added "the head shows with a wig, round face and 8 cm long ears. Nose and chin are broken but part of the neck is still there."